Well, it's been over a week since the Finger Lakes Tatting Guild (Hector) convention, and I am still catching up. I was worn out by the time I got home, but I was glad I went. Karey and her group put together an excellent weekend. Here is a group hard at work in a class. More classes. Note the lovely shawl tatted from a Mary Konior motif worn by the lady in the right of the picture. Ginny teaching and a few of her lovely ornaments. Meanwhile DH and DS3 went to the park. Western NY has some beautiful places. First off, I would like to thank everyone who has ordered my new teapot book, and everyone who has said such nice things about it on their blogs. I am sooo busy trying to get ready for Hector. I've strung beads for Ginny's class, but I need to find/empty some shuttles for Karey's class and find some more to demo in the class I'm teaching. I remembered to recharge the camera battery, but I forgot to buy eggs for the brownies I was going to make. I need to bind some more books. When will I pack?? Gaaaah!!! Here's a hint for anyone taking my class. There will be 3 cut and ties in the pattern. If you wind 5 1/2 yards each of the 2 contrasting colors of thread on your shuttles, that should be enough for the first 2 sections. I am looking forward to seeing old friends there and meeting new ones. I hope to be there in time for supper Friday night. (I'll be the tired, dopey redhead.) Karey recommended the Seneca Lodge and that's where I'm staying. I hope some other tatting folks will be there too. It would be great if I could find someone to ride with to the fire hall so DH and autistic DS3 can sleep late instead of delivering me there. I get to play tatting all day while they go sight seeing. 3 am, really must go to bed. 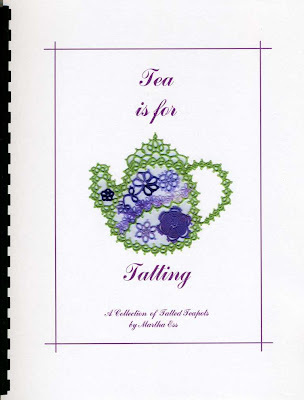 In honor of International Tatting Day today, I am pleased to announce I am now taking orders for my new teapot book! It's printing right now and should be ready for mailing this weekend. Gina Brummett, Jane Eborall, Pamela Myers, and Sherry Townsend were my test tatters. I could not have done it without their help. Please see my website http://home.bellsouth.net/p/pwp-tatsamore for ordering information. By the way, if you want more than one book, be sure to let me know and I can give you discounted combined shipping. I can send a Paypal invoice with the discounted shipping rate or tell you how much to send as a check or money order. If you want just one copy, you can use the Paypal buttons on the website. Yes, I will be bringing copies to Hector in a few weeks. 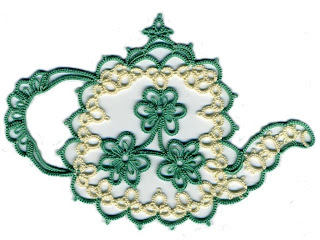 Have a Happy Tatting Day and remember to eat lots of chocolate!